Desktops v1.0 - Virtual desktops utility from Windows Sysinternals ~ Android Forever! I'm not a huge virtual desktops fan, but maybe I just haven't caught on. If you are fan, here's a new offering from Microsoft. 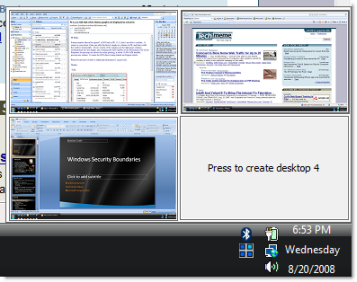 From the web site: "Desktops allows you to organize your applications on up to four virtual desktops. Read email on one, browse the web on the second, and do work in your productivity software on the third, without the clutter of the windows you’re not using. After you configure hotkeys for switching desktops, you can create and switch desktops either by clicking on the tray icon to open a desktop preview and switching window, or by using the hotkeys."